Unique Wellube, a division of Unique Maritime Group (UMG) which is one of the world’s leading integrated turnkey subsea and offshore solutions provider, is pleased to share its expansion, investment and strategic plans @ ADIPEC 2014 which is being held at Abu Dhabi National Exhibition Center (ADNEC), from the 10th to the 13th of November 2014. The ADIPEC exhibition is ranked amongst top 3 prominent shows for the oil & gas industry in the world. It is an unrivalled show which unites the oil & gas industry professionals under a common platform to showcase innovations in technology and highlight issues currently challenging the industry. It is a meeting point for industry leaders across the world to discuss the changing face of the industry. Unique Wellube offers specialist engineering services and associated products to a diverse range of industries. The services are focused on ensuring plant and pipeline operability and avoiding costly unplanned shutdowns by allowing intervention and plant critical maintenance work to be carried out in a safe and cost effective manner. Some of its products and services include: Hot Tapping & Line Stopping, On-Site Machining, Under Pressure Leak Sealing, “Uni-Test” Online Valve Testing, “UniSeal” Pipeline Repair Clamps, On-Line Valve Maintenance, Pipe Freezing, Composite Wrapping, Portable On Site Machining Sales & Rentals, Custom Pipeline Fittings, Pipeline Pressure Testers and Platform Decommissioning Services. UMG has taken a step forward with a major focus on strengthening its Oil and Gas Division with an investment of USD 2.5 million. This is also steered with massive expansion plans backed by strategic planning. Unique Wellube has launched its products & services in promising markets such as KSA, India, UK and West Africa. The KSA is an integral part of the Middle East which offers some of the most beneficial opportunities for expanding the oil & gas business within the region. India and the UK are also growing rapidly in the oil & gas field with a vast majority of independent and government-run organizations competing to bring in the latest technologies and contributing to the overall economic growth. West Africa is also considered to be a major investment hub for the industry due to increased production and growth plans for the African sub-continent. A lot of medium-scale to large-scale pipeline projects are undertaken in West Africa. In addition to the existing line-up of products, our cargo-carrying containers line of business represented by our JV, OEG Unique will also be unmasked to customers within these markets. This will also be combined with our marketing initiatives to strengthen Unique Wellube’s brand value in the market. During the 4-day course of the exhibition, Unique Wellube will showcase its impressive line-up of products and services to the oil & gas industry. Some of these products include the flange and pipe weld testers; “Uni-Test” Online Valve Testing equipment; diamond wire equipment and the Pipe spool which includes the Hot Tapping machine. To know more about these products and services, please visit Unique Wellube at stand # 1332 during the show. 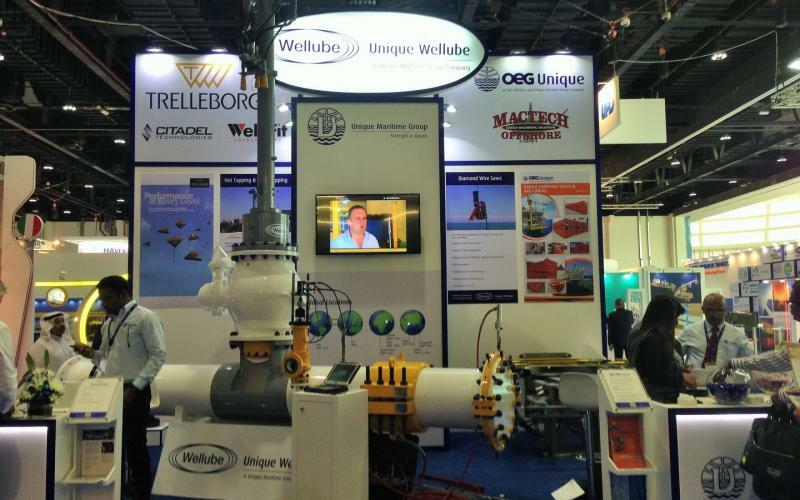 Two of UMG’s trusted partners, Trelleborg Offshore and OEG Unique will also be present along with Unique Wellube to market and showcase their range of products and services @ the show.